In the brand-new fossil vault at the University of the Witwatersrand, Johannesburg, in South Africa, shelf space is already running out. 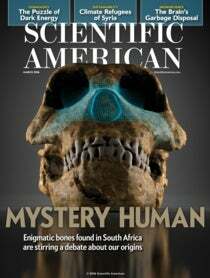 The glass-doored cabinets lining the room brim with bones of early human relatives found over the past 92 years in the many caves of the famed Cradle of Humankind region, just 40 kilometers northwest of here. The country's store of extinct humans has long ranked among the most extensive collections in the world. But recently its holdings doubled with the discovery of hundreds of specimens in a cave system known as Rising Star. According to paleoanthropologist Lee Berger and his colleagues, who unearthed and analyzed the remains, they represent a new species of human—Homo naledi, for “star” in the local Sotho language—that could overturn some deeply entrenched ideas about the origin and evolution of our genus, Homo.